Features: 6th Man Advantage - Give your home team the advantage on the floor with the energy of the crowd. Maximum Passing - One press of a button puts a full slate of pass options at your fingertips. On-the-Fly Coaching - Call plays, queue up subs, check on your players and even change coaching settings without ever having to pause the action. Range Meter - Know the right spots on the floor for each player to take their shots and minimize missed buckets. 2K Soundtrack - Featuring Jurassic 5, J. Dilla, MF Doom, Dilated Peoples, The Kooks, The Black Lips and more. Description: 'College Hoops 2K8' continues the legacy of the NCAA franchise with all new features, including the 6th Man Advantage feature that lets the crowd atmosphere affect the game performance of teams, a training mode where players can improve their skills through practice, and more. 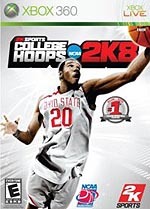 'College Hoops 2K8,' the #1 rated college basketball game five years running returns to the Xbox 360, with the deepest feature enhancements in the history of the franchise. 2KU - Completely redesigned arena atmosphere creates the most authentic college basketball experience ever. Verdict: '2K8' basketball games just get it right. They offer some of the most realistic gameplay ever seen in a video game. If you are looking for a true sim, CH 2K8 is the game to get. You can run with multiple teams in your Dynasty mode (legacy, create and easily modify players, and what's neat about this year's game is you can create a prospect at the high school level, playing with him in the summer camp games. With your team you can monitor all of these players progressions to find out who you want to recruit. It is really a nice added feature to the game. As for the gameplay itself, there are still some minor issues: 1) The CPU on your team does not get back in transition to guard other players very well. And by the time you switch off to the player with the ball, it's too late. They have already scored. 2) Too many missed open lay-ups and mid-range shots. Star players on North Carolina just don't miss open shots like that! 3) Graphics, though decent, still look a bit cartoonish to my standards. The arenas look OK, but not nearly as good as you'll find in 'March Madness 08.' Player models are good, but again, I don't think they come close to what MM has produced. 4) The menu screens, though minor, 2K really needs to update those. They get the job done, but they're a bit outdated. Again, 'MM 08' has the better menu screens. 5) The color commentary: '2K8' needs to really work on this. It's just not as exciting as it should be. One cool feature is that you can go on Xbox Live and download roster saves which will give you the correct names and appearances for every player. You can even download saves for the unlockable classic and all-time teams! Now that's damn cool! Overall this game is fun to play besides some minor issues. It lacks in certain areas compared to 'MM 08,' but it definitely offers the better game play, depth and freedom you will want in a college basketball game this season.